Chicken is one of the most versatile meats there is. It’s easy to cook, cheap and you can get it anywhere. It lends itself to so many flavour combinations and one of those ‘safe’ ingredients for if you have people over for dinner, because so many people like chicken. The roast chicken in particular is always a winner. Summer time for a sunset picnic, or winter for a Sunday roast, you just can’t beat it’s versatility. So go and buy your roast chicken, put your apron on, and have a try at this deliciously rustic and simple dish. Before we get started, my technique of cooking chicken is very slow. I use a 110 degree celsius oven and cook for approximately 2 hours. I do this to keep all the moisture in the meat. When you put a chicken into a hot oven, the Nutrition Guru taught me that the proteins contract and squeeze all of the lovely juices out of the meat and into the bottom of the roasting pan. But, by cooking it slowly you prevent the contracting of the proteins, the chicken keeps its shape and best of all, all the delicious juices (which is where all the flavour is) are retained in the meat. When you start to carve it, the meat just falls off the bone. We don’t use butter rubbed all over the chicken, as many recipes do. We don’t find it necessary. Instead, we use a dash of olive oil. Any herbs will work with this dish. 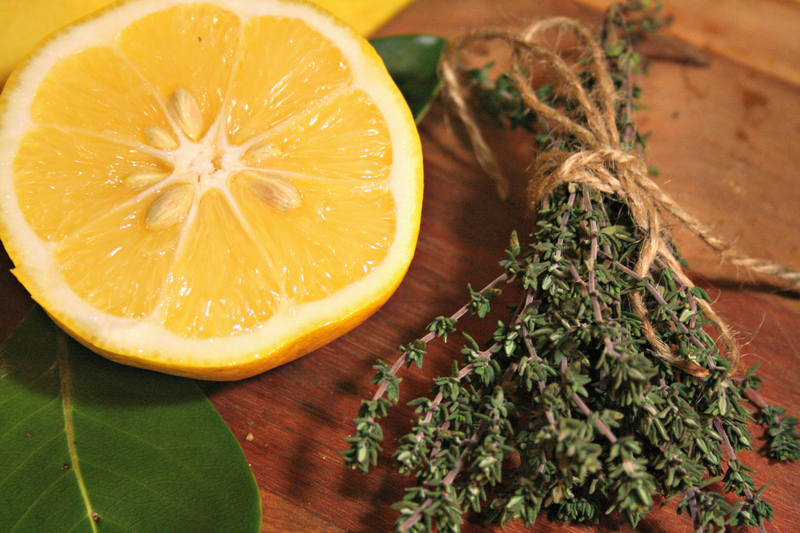 Don’t have thyme? No problem, use rosemary, tarragon, marjoram or anything else you have. The lemon imparts a delicious fresh zing right through the chicken, and can be used later to squeeze all over the hot chicken when serving. 1 small sized chicken (untrussed). 1 knob of garlic (unpeeled). Wash the potatoes and slice into thin wedges (as pictured). Cook on 110 degrees for 2 hours (cooking times will depend on the size of the chicken. Large chickens will take longer). Hot to test if the chicken is ready: Insert a skewer into the chicken between the leg and the body. Remove skewer. If clear juices run out, it is ready. If red or pink juiced run out, chicken requires longer cooking. When you have determined chicken is ready, place chicken under the griller section for 5 minutes each side to brown. If you don’t have a griller, turn oven up to maximum temperature and cook for 5 minutes only (longer will dry the chicken out). 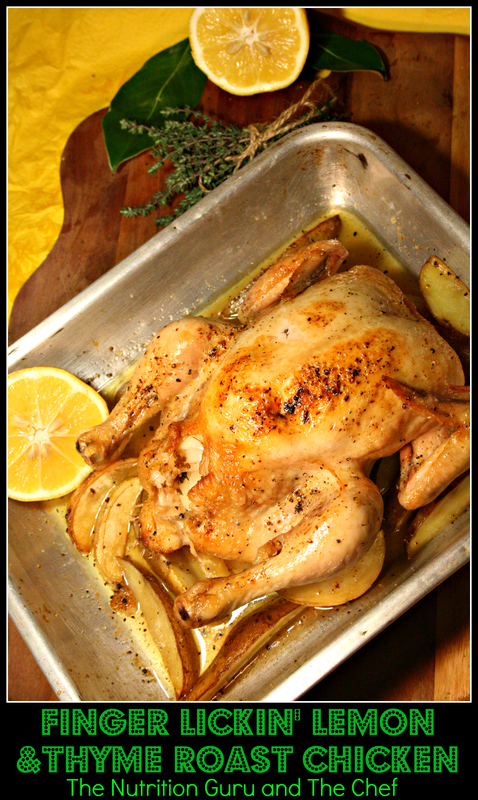 Use the lemons from the cavity to squeeze over the chicken, or optionally serve on the side. A good source of protein for all cells to grow and repair. Contains zinc for metabolism as well as healthy skin and nails. Remove the skin, as it is a source of saturated fat. Using lemon juice and herbs to flavour the chicken means you don’t need to add butter or unhealthy sauces, simple is often the best. Do you have a secret tip for cooking the perfect roast chicken? Drop us a comment.